Elenin C/2010 X1 | Pleasant's Personal Blog! Elenin and Levy – More Warnings from Nature? Recent activities in the sky have sparked interests in the NEA Research world as news on three potentially hazardous objects viz asteroid 2005 YU55 and the comets ElEnin and Levy hit the headlines in the past few months. Discoveries like these usually cause panic and often incredible and funny speculations and assumptions. Many are already raising questions as to whether we should be concerned or not. The following video shows some of the potentially hazardous asteroids on close encounter with Earth. As mentioned in my previous article, 2005 YU55 will pass as close as 0.85 lunar distances or roughly 200,000 miles from earth between November 3 and 13 this year. The closest approach will be on November 8 at 07:13 UT. Though close, there is nothing to be concerned as per the latest reports. Named after its discoverer, as is tradition, comet Elenin also known as C/2010 X1 to the International Astronomical Union was discovered by Russian astronomer Leonid Elenin on December 10, 2010 using the International Scientific Optical Network’s robotic observatory near Mayhill, New Mexico. It is as a small, icy Solar System body. It should not confused with rogue planets or brown dwarfs or the alleged Tyche or Nibiru. During the time of its discovery, it was roughly 647 million km from the Sun between Jupiter and Saturn’s orbits. Classed as a long period comet, it takes more than 11,600 years to make a single orbit of the Sun and was discovered during one of its rare solar visits. In its closest approach to the Sun, Elenin will pass at 0.48 AU on September 10 2011. The chances of collision with the Sun is just speculation as is the passage between Earth and Moon. On October 16 2011, it will pass closest to Earth at 34.9 million km or 0.233 AU from us which is approximately 90 times further than one lunar distance. Except for experiencing some possible tail debris on November 1 as Earth enters the tail of ElEnin, there won’t be any major effects on Earth unlike false claims like earthquakes caused by its gravitational effect since the mass of its nucleus which is about 20 billion tonnes is too small to cause major changes on the Earth or the Moon. Thus, there is not much to be expected of Elenin though some astronomers are concerned since it is speeding up as it closes in on the Sun. Comet Levy P/2006 T1 was discovered by David Levy visually using a 0.41-m reflecting telescope, as it passed about 40′ to the north of Saturn just before dawn at around 12h UT on Oct 2, 2006 from his Jarnac Observatory near Tucson, AZ. It was added to the NEO Confirmation page, roughly 8 hours later marking David’s 22nd discovery. His last discovery was the comet Takamizawa-Levy, 12 years ago in April 1994. Its astrometry revealed that it is a short period comet approaching the Sun a little over once every 5 years (5.24 years) with perihelion distance placing it close to the position the Earth occupies in late December. 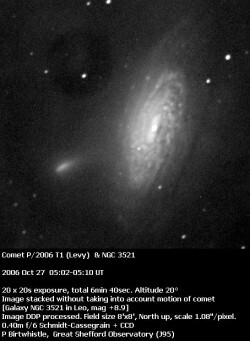 On 2006 Oct 27 at about 03:30 UT, Levy only about 1′ north of the nucleus of the bright galaxy NGC 3521 in Leo. During its 2006 passage, it achieved an apparent magnitude of ~9.5. 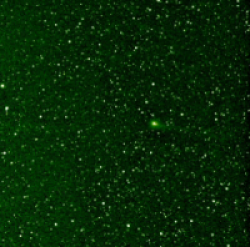 Though believed to have been recovered on 03 June 2011 at magnitude 19.8, the recovery was never confirmed by other observatories and the comet was never observed since 01 December 2006 since it only has a confirmed observation arc of 60 days. The next perihelion is calculated to be on 11 January 2012 at 1.007 AU from the Sun. The predicted perigee on 2012-Jan-20 is between 0.15 to 0.20 AU with nominal at 0.18 AU. The predicted apparent magnitude in 2012 might be 7 with elongation of 90°. It is said that Levy will go past above us at a rate faster than our own planet’s orbital velocity on January 29. Recently a warning was issued by former NASA consultant and US space expert Richard C. Hoagland that Elenin, is under “intelligent control” and heralds a warning to all humanity of a greater global catastrophe. NASA space scientist David Morrison has reported pretty much the same though he has added that these asteroids and comets will pass at safe distances from Earth. Interestingly, some scientists had previously speculated that the two distinct rows of 8 small circular objects trailing Elenin were UFO’s belonging to an as yet unidentified “extraterrestrial civilization.” Though supported by Hoagland, this claim seems to be just fanciful (or wishful) thinking. In any case, these three objects are not going to hit us or cause any significant global catastrophe as feared by many. I wanted to include more spectacular pictures, but strangely WordPress is not agreeing with me today. I will try to add them at a later time.